http://www.vladtv.com - Underground legend Immortal Technique sat down with VladTV and shared his views on Eric Garner, Mike Brown, crooked cops, and the higher-ups we should really be upset with. When it comes to Eric Garner, the "gentle giant" who was killed while in a chokehold by NYPD cops, Tech reminds us that the chokehold itself was illegal, and would be nowhere near justifiable even if they really thought he was selling loose cigarettes, the initial reason cops claim they stopped him. Tech also gets into why many cops don't look at the average taxpayer as someone who pays their salary, but instead gives that respect to the gatekeepers in government who decide where our tax dollars go, and that those are the ones who truly deserve our anger. 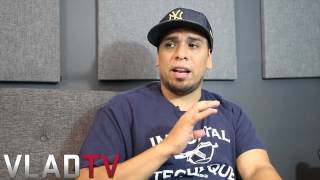 Aug 28, 2014 · 1 comments for "Immortal Technique Talks Eric Garner & Crooked Cops in Vlad Interview"
Lord Jamar on Drake's Claim of Being a "Rap King"